My mother-in law will be traveling to HongKong tomorrow. She will be touring around Hong Kong Disneyland. I was so excited for her while she’s packing up her things today; it makes me wanna go with her too… (ha.ha.) Actually, I have never been to Hong Kong Disneyland and this is one of the places I’d like to visit. It is very easy to visit Hong Kong nowadays because there are now affordable air fares as well as affordable travel promos. So, as early as today I am now planning of saving money for this trip. Wondering about the photo above? This photo was not taken at Hong Kong Disneyland (as it was pretty obvious). Two weeks ago, we had the opportunity to visit “Trinoma,” one of the biggest mall in Manila. 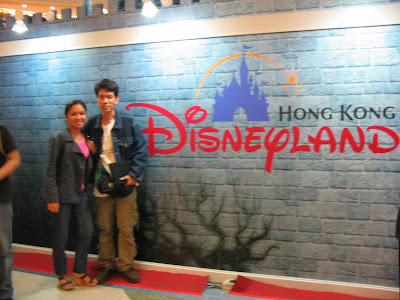 While inside the mall, we saw their very cute castle decoration with a caption “Hong Kong Disneyland”. Without delay, hubby and I posed beside the castle and imagined that we were in Hong Kong Disneyland. Anyway, I am hoping to have a photo at the real HK Disneyland soon. wow!..kinsa mn kauban sa imo mommy? ha!ha!ha! nag wonder sab kadyot kong kanusa ka nakaad2?